Buy Meridian Organic Smooth Almond Butter 454g in the UK from our online shop or directly from our independent Scottish store. Organic almonds are roasted in their skins then ground until smooth. As official Meridian stockist, we sell genuine Nut & Seed Butters directly from our shop in Scotland and online throughout the UK. Meridian is committed to producing foods that make you feel great. They select the finest, simplest ingredients so that you can enjoy nature’s energy. View more products from Meridian. Where can you buy real Organic Almond Butter 454g safely online? 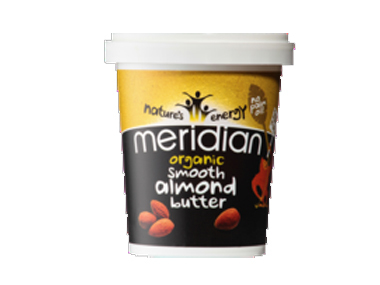 If you are wondering where you can buy Meridian Organic Smooth Almond Butter 454g safely online in the UK, then shop with us. We are an actual health foods shop; with real people selling real foods and products. Our award-winning independent shop is located in Stirling, Scotland since 1976. You can buy our Organic Food and other genuine Nut & Seed Butters in store or safely place an order with us online or over the phone. Organic Almond Butter 454g - Meridian Organic Smooth Almond Butter 454g in Nut & Seed Butters and Foods.